Chinaworker.info – Hong Kong’s democracy struggle – how to break the impasse? Increased authoritarian rule and a political crackdown in Hong Kong have not translated into stable government. The Shatin-Central subway line construction scandal, the plan to build an artificial “tycoon island” near Lantau, the refusal to prosecute two high-ranking pro-Beijing politicians, attacks on CSSA payments for the elderly, and the collapse of the public healthcare system, all these crises have shattered the government’s credibility. 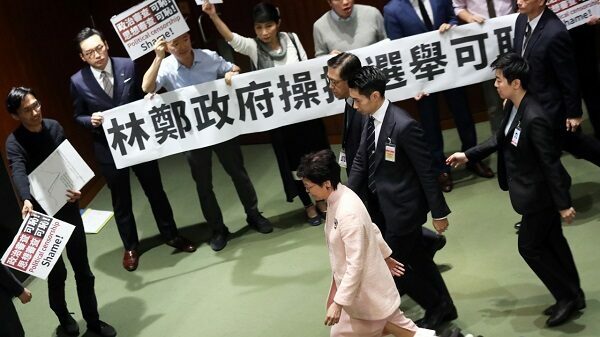 Following January’s botched attacks on CSSA payments to the elderly, the popularity of Chief Executive Carrie Lam Cheng Yuet-ngor has fallen to a new low with an approval rating of minus 23 percentage points. Severe repression has not made Lam’s government strong. Although the opposition political parties are in a state of paralysis, the government itself suffers from extremely low levels of public support. While China’s ‘Communist’ regime (CCP) under Xi Jinping has tightened its control over Hong Kong, it is largely oblivious to the real mood of Hong Kong’s people. By cranking up the political pressure on Lam’s government, Beijing could at any moment trigger significant unrest. The government continues its unprecedented attacks on democratic rights. While the controversial National Anthem Law is being pushed through the legislature, a new extradition treaty with mainland China is also being hammered out, which will further erode Hong Kong’s separate judicial system and threaten civil rights. Hong Kong citizens who challenge the CCP dictatorship could soon risk being handed over to China’s guilty-if-we-say-so legal system on “national security” grounds. This year’s District Council elections will see widespread political screening to eliminate pro-democracy candidates that the authorities accuse of advocating “self-determination” or “Hong Kong independence”. But an even bigger question is whether the CCP will also demand disqualification of candidates who support calls for “ending one-party dictatorship”. If so, next year’s more important elections to the Legislative Council (Legco) could see virtually all opposition candidates barred from standing. This would complete the Legco’s metamorphosis from a powerless talking shop into a mere clap-o-meter for government policies, no different from China’s NPC. After “CY” Leung Chun-ying stepped down as Chief Executive two years ago he did not fade away. He has very much hung around representing the CCP’s hardline approach to ruling Hong Kong, keeping the pressure on Lam’s government from the sidelines, demanding more ruthless action for example by cracking down on pro-independence localists and pushing for Article 23 national security legislation as soon as possible. The CCP needs CY to continue in his role as a political thug and this is why he enjoys a high degree of official protection. This is in sharp contrast to his predecessor Donald Tsang, who has just been released after 20 months in prison for “misconduct in office”. Moreover, if CY were to be prosecuted and even convicted on corruption charges in connection with the HK$50 million payment he received from Australian engineering firm UGL while in office, this would also compromise the authority of the CCP regime, which made him a vice chairman of China’s prestigious CPPCC after he left Government House. Due to the political weakness and lack of a fighting strategy of the moderate pan-democrats, Hong Kong’s mass democracy movement has been paralysed. The ruling camp’s arrogance and self-confidence seemingly knows no limits. Regina Ip, of the pro-establishment New People’s Party, now boldly declares, “the times are different”. The claims we are unlikely again to see 500,000 people take to the streets as was the case in 2003, when the last attempt to introduce Article 23 legislation was defeated. That mass protest ended Ip’s career as security minister. Now she claims there was a unique environment in 2003, with economic recession, the SARS epidemic, and a housing bust, all contributing to popular unrest, rather than opposition to Article 23 in itself. Ip is guilty of historical revisionism. The government was completely stunned by the mass turnout in 2003. Then Chief Executive Tung Chee-hwa was quoted by news media in the morning predicting that only 50,000 people would go to the streets. Today’s rulers, as Ip shows, are equally out of touch with reality. The disparity between the rich and poor, crazy house prices, and the decline in people’s livelihoods, are worse today than in 2003. There is no shortage of objective factors for mass revolt. The mass anger shown against Lam’s plan to build HK$1 trillion worth of artificial islands near Lantau is a warning of the real mood among grassroots workers. The problem is there that is no clear organised leadership or strategy to resist the government’s authoritarian pro-rich agenda.The democracy movement has suffered repeated setbacks as a result of timid and indecisive leadership from the pan-democrats, who value capitalism’s need for “stable” profit making above the population’s need for democratic rights. These can only be achieved by far-reaching mass struggle which by its very nature poses a threat to the capitalists’ interests. This has inevitably lowered the confidence of the masses in the current struggle and that in turn has created a certain living space for the conservative pan-democratic leadership. After their defeat in the two legislative by-elections in West Kowloon the pan-democrats concluded, incredibly, that their election campaigns in the past have been too politicised and radical. Therefore, they say, they should now concentrate on ‘parish pump’ politics. They blame the “low consciousness” of the masses for this further retreat from the road of struggle. Within the leading circles of the pan-democratic camp there is now a cynical calculation that they can benefit from the government’s attacks on the radical wing of the movement and the largely fragmented localists (Hong Kong nationalists). Their thinking is that the radicals like ‘Long Hair’ of the LSD and youth group Demosisto will be prevented from running in the next Legco elections, and therefore radical votes will automatically flow to the moderate pan-democrats. This marks a further adaptation to the authoritarian regime. Politics is not only about counting votes. Growing sections of the population see that the moderate pan-democratic politicians are incapable of leading the democratic struggle and are in fact reducing themselves to the role of a token opposition. Consequently, many are now less inclined to vote for them. This was seen clearly in the two West Kowloon by-elections, which showed that the previously assumed “60/40” division of votes, between the pan-democrats and the pro-government camp, is no longer a foregone conclusion. Unless a real political alternative is presented that offers a way to fight back against the government’s right-wing pro-business agenda, then the pro-Beijing parties with their superior campaign machines and unlimited funds will enjoy a big advantage in heavily rigged elections. Another conclusion of the pan-democrats after the by-election defeats is that they were unable to absorb votes that went to localist candidates last time around. Now there is an attempt by sections of the pan-democrats to mimic some localist rhetoric, while steering well clear of the independence issue (which Beijing has declared a ‘red line’), in the hope of co-opting the localists’ voter base. 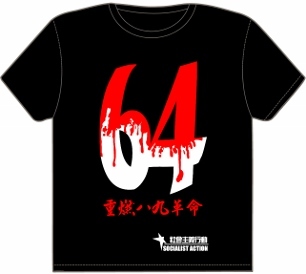 For example, the Labour Party’s Lee Cheuk-yan published an article recently in which he borrowed the localists’ rallying cry of a “brave war”, implying a willingness to use violence. This was a blatant appeal for localist votes. Nobody seriously believes moderates like Lee will sanction violent actions, but they can opportunistically steal some localist rhetoric and phraseology, such as opposing ‘new immigrants’ (a term for mainlanders) and official promotion of Mandarin language as part of a populist pitch for former localist voters. Socialists oppose the defeatist position of the pan-democratic leadership and their opportunistic manoeuvres. We call for the reconstruction of a mass democracy struggle independent of the moderates and their kowtowing before capitalist policies. What is lacking most of all in Hong Kong at present is organised struggle by the working class in defence of living standards and against the never-ending attacks of the government. This struggle, and the resumption of genuine struggle for full and immediate democracy, including democratic control of the economy and society’s abundant wealth, cannot succeed without building unity with workers in China to overthrow the CCP’s pro-billionaire dictatorship. Rebuild a fighting democracy movement based on active grassroots democratic control! 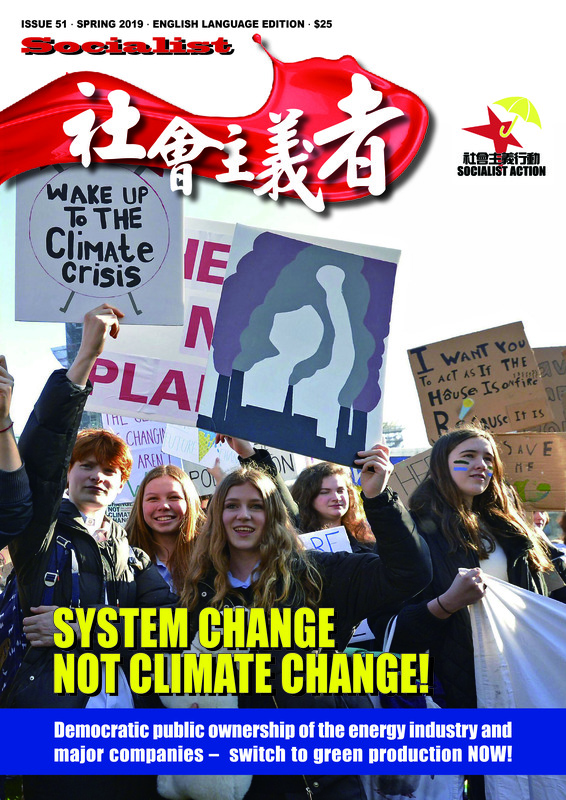 Relaunch mass struggle for immediate and full universal suffrage, from 16 years of age! Discussing independence is not a crime – defend freedom of speech against bans and censorship! Replace the rigged Legco with a real elected People’s Assembly with powers to choose the government, block white elephant schemes, launch a mass public house building programme and plough billions of dollars into cash starved public services! Democracy is never going to happen under the rule of the capitalist tycoons – break their grip on the economy with socialist policies and nationalistion to deliver power to working people! Link the democracy struggle with mass protests in China – bring down capitalism and one-party dictatorship!